With every turn, the Wonderland Trail reveals glaciers, cascading waterfalls, sub-alpine meadows, lush stands of temperate rainforest, rivers, lakes, canyons, all set to an expansive backdrop of Washington and the ever-changing profile of Mount Rainier. No two corners of Mount Rainier seem all that alike, and as the hiker passes through each day on the Wonderland Trail, each day will be remembered uniquely as a hike to someplace different. 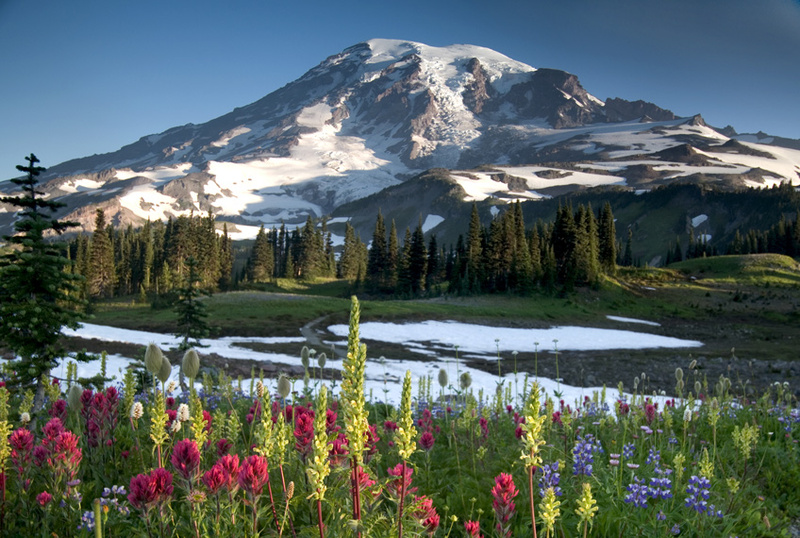 The Wonderland Trail explores the glacial valleys and volcanic ridges fanning outward from Mount Rainier. When the trail is not climbing one ridge, it is descending into the next valley. The ascents and descents make it a challenging hike that will test your strength, endurance, and the construction quality of your hiking boots. The Wonderland Trail measures in somewhere around 93 miles. A number of side hikes along the way will tempt more miles from you. Most people hike the entire trail in about ten days, and the Park Service allows up to fourteen days to complete the trail. At its high point, the Wonderland Trail passes over Panhandle Gap, just shy of 6,800 feet. Its lowest point is in the old growth rain forest along Ipsut Creek at 2,450 feet. Circumnavigating the mountain, you'll balance your elevation gains and losses somewhere around 23,000 feet. There are eighteen wilderness campgrounds along the route, each with a pit toilet, anti-bear food storage (typically a pole or cable to hang a stuff-sack), and a nearby water source (most often a stream or a lake). Wilderness camps have two to eight standard campsites restricted to two tents each. Fifteen of the wilderness campgrounds have a group site, allowing more than two tents. Due to limited numbers of backcountry permits issued, the campgrounds are nearly always at capacity throughout the summer. For more info on wilderness camping, see designing an itinerary and getting a permit. There are several convenient locations along the Wonderland Trail for storing food caches with the Park Service. Food caches can be mailed or delivered in person. You can learn more about this in the caching food section. Wilderness camping permits are required for anyone staying overnight in the backcountry. Like many great American trails, permits are in high demand. The Park Service accepts applications from March 15th to April 1st. In April, they hold a lottery to assign reservations. If you miss this window, your chance of getting a permit for the entire Wonderland Trail is slim to none. For 2016, a software problem caused the Park Service to cancel their reservation program for the season. All 2016 permits will be by their walk-in system only. For more info, see getting a permit. Mount Rainier National Park gets heavy precipitation. The trail is buried by snow in some places until late July. This is when the main hiking season starts. This is also the time of year when the trail crews finish repairs and bridge installations. Some of the Wonderland Trail's streams and rivers are difficult to cross earlier in the year during the spring snowmelt. You can read more about the weather in when to go. The main hiking season is from late July to the middle of September. This is the warmest part of the year here, and when the mountain sees the least precipitation. The density of hikers tends to thin following Labor Day. Usually after the middle of September, heavy precipitation returns to the Northwest. In the park, the roads to the high elevation trailheads close after the first snow. As autumn progresses, the snow line descends the slopes as the temperature drops. Soon after, thick snow blankets the mountain for another winter. Learn more about when to go here. Like this free web guide? It's a sample of our new book. Get the backpacker’s field companion to Mount Rainier’s famous 93 mile loop trail. Loaded with gorgeous photos and fascinating facts. This version is built exclusively for the iPad and iPhone. An enjoyable and informative read by veteran trail writer Tami Asars. Available in print and for Kindle. This laminated map will hold up for years and is one of the best available hiking maps for Mount Rainier National Park. 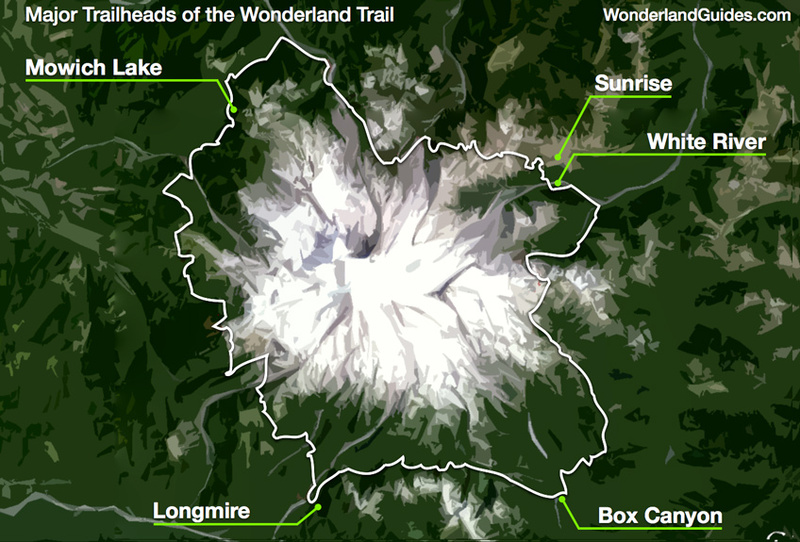 Features GPS waypoints, an elevation profile of the Wonderland Trail, and a climbing map of the mountain. In a typical year, the Wonderland Trail is accessible from late July to the end of September. These months are when most people hike the entire trail. The table below provides a summary of how conditions change throughout the normal hiking season. * Always expect bad weather, regardless of the season. It is rare to see ten days at Mount Rainier without at least some rain, even at the peak of hiking season. 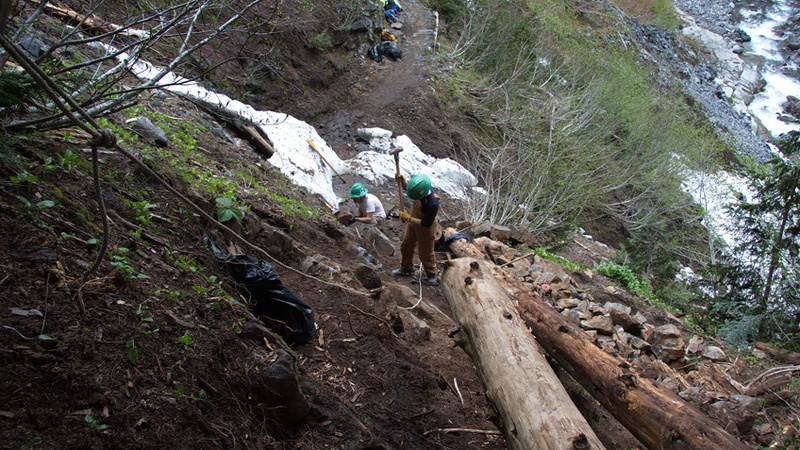 WTA volunteers make trail repairs in late June. Many years it can take until late July for repairs to be complete on the WT. If you jump the gun and hike too early in the summer, you will face difficulties and dangers. You could see challenges from navigation, river crossings, rain, snow and blow-downs. A few weeks later, Mount Rainier's sudden summer can be full effect, the weather balmy, and the trail in good repair. It can be like night and day. Most people will be happiest waiting for the normal hiking season of late July to the middle of September. It is best to check the snow levels in early March before you apply for your reservation. If snowpack is higher than average in March, beware of making plans too early. If it's been a dry winter, you might be able to hit the trails earlier than usual with respect to snow, but there is no guarantee the weather will be good. You best bet will be to wait for the normal hiking season of late July to the middle of September. Late July is the earliest the Park Service recommends hiking the trail. Depending on the previous winter and spring, you may still end up hiking on snow at higher elevations. Snow hiking is slower and more of a challenge. You’ll want to give yourself more time to hike the higher elevation stretches of trail. 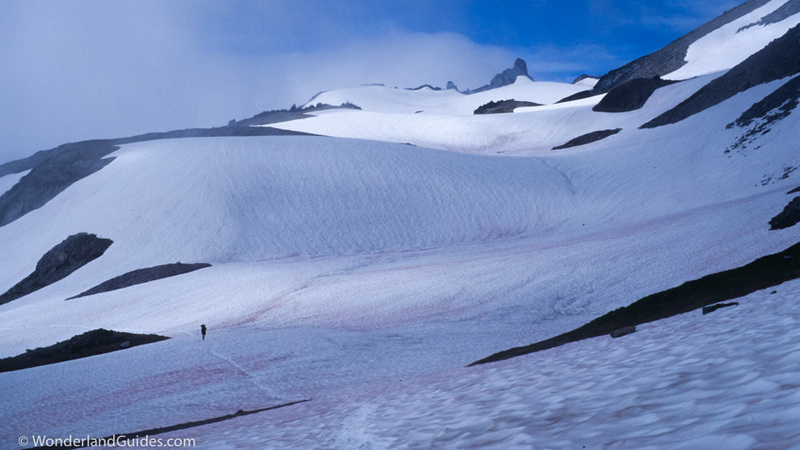 In late July snow can still cover higher elevation stretches of the Wonderland Trail. The optional Spray Park route can be difficult early in the season. Most hikers are happier sticking to the trail through Ipsut Pass when there is still snow on the ground at Spray Park. Tip: Hiking poles can help you to keep your balance on snow. High-top boots and gaiters will help to keep your feet dry when the snow gets deeper. When the snow melts back from the subalpine meadows, the wildflowers explode almost overnight. It is a dazzling sight. The subalpine lakes will be brimming with snowmelt. When the wind is calm, some lakes offer exquisite reflections of the volcano. Wildflower meadows near Paradise at the beginning of the hiking season. This is also when mosquito and fly populations peak. The mosquitoes and biting flies can test your sanity. Don’t forget the insect repellent. Long sleeves, collared shirts and pants will help cut down on the number of meals you donate. If you use a tarp instead of a tent, you might appreciate using a mosquito mesh insert for protection. From the middle of August to Labor Day, the trail sees big crowds and for good reason. The trails will be in good shape, bridges in place, and inclement weather the least likely (but still possible). The snow melts from higher elevation destinations like Spray Park and Panhandle Gap, making these easier for hiking. The tail-end of the wildflowers in Spray Park, early September. The wildflowers start fading out from their grandest displays and diminish at lower elevations. Depending on the year's snowpack, at higher elevations patches of wildflowers can still be in full bloom. Labor Day weekend sees a big bang of visitors, and overnight the crowds start dwindling as the new school year begins. The trail conditions are rarely better than this time of the year. The snow is gone, muddy sections of trail have dried out, and rivers occupy just a fraction of their former channels. Gone too are many of the wildflowers. Many of the smaller subalpine lakes shrink back, and smaller streams can vanish. The weather can be hit and miss, but when it's sunny, this time of year offers the most comfortable hiking. The nights start getting colder and you may want a three-season sleeping bag. The frost on your rainfly means that the mosquito and fly populations vanish from the annoyance radar. Late season hiking can be comfortable when the weather is good, but autumn rains can arrive anytime. Some years the atmospheric river of the Pacific Jet Stream starts drenching the Cascades from now until the next summer. Other years, dry weather can stretch deep into autumn, offering some of the most comfortable backcountry conditions possible. When the first snows come or mid-October arrives, the Park Service closes the Mowich Lake and Sunrise Roads for the winter. After these closures, you won't be able to use those trailheads, or their ranger stations for storing food caches. As the autumn progresses, the days grow shorter and the nights longer. The chance of severe weather grows with each day. When the autumn storms arrive, Mount Rainier’s backcountry is not a good place for the living. While you should always be prepared to face bad weather regardless of the time of year, expect a greater chance of sideways rain and snow in the autumn. Always be prepared to stop and set up a shelter if necessary. Rivers can surge in hours, trees can blow down in high winds, and whiteout conditions can sometimes hit higher elevations. 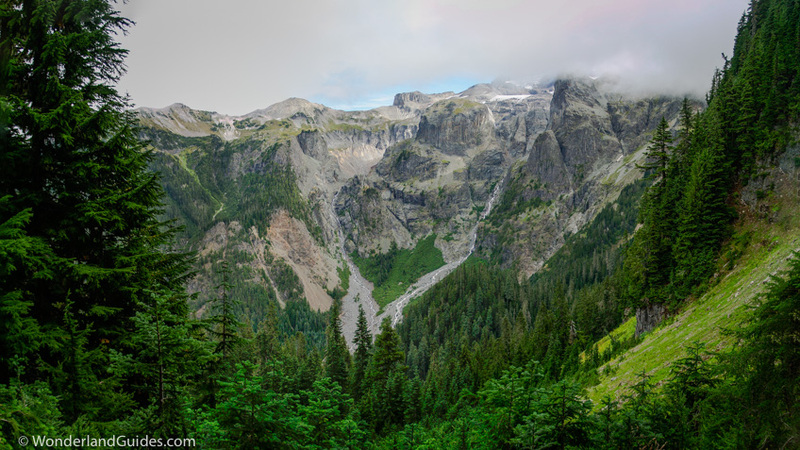 The Wonderland Trail is one of the premier backpacking trails in the Pacific Northwest. There are more hikers itching to hit the trail than there are wilderness campsites to hold them. The park service requires backpackers to get a permit for any overnight wilderness camping. Because demand for permits exceeds availability, the park assigns reservations via a lottery. You might be happiest if you adopt the attitude that you'd like to hike the Wonderland Trail sometime in the next few years. Put in a permit request each March. If you don't get one, then c'est la vie. Plan your hiking season elsewhere and then rinse and repeat next year. From March 15th to April 1st, the park accepts priority reservation requests. Anyone wanting to hike the entire trail should send in a request during this period. Follow this link to read the latest instructions from the park service, or get a permit request form here. After April 1st, the park processes the priority requests in a random order until the campsites get booked. Requests received after April 1st get filled in the order they arrive. Note that your odds are slim of getting a permit if you miss the priority deadline. As long as there are campsites remaining, the park publishes a spreadsheet each day showing the remaining camps. At some point the park will likely stop accepting reservation requests for the rest of the year. From this day forward, all permits are via walk-in only. The park reserves a small number of campsites exclusively for same-day walk-in permits. The only way to get one is to be at the front of the line at one of the ranger stations on the morning you hope to start your hike. This sounds easier than the reality though. Many ranger stations in the park issue permits. Even if you're first in line at a particular ranger station, any available campsites may have already been assigned to a hiker elsewhere. Another catch is many permits will be for trips lasting a week or longer. The Wonderland Trail has several starting points. This means that many days there may be no campsites available anywhere because they all got assigned days before. You could be the first hopeful hiker to the park for the day and still not get a permit. The one realistic hope you might have in getting a walk-in permit is late in the season. Demand for permits falls after Labor Day. Every year demand for permits goes up, so this may not be as true this year as it's been in the past. If you plan to hike late in the season, beware that autumn rains could be just around the corner. If you can't get a reservation it's still possible to visit many stretches of the Wonderland Trail. You do not need a permit to day hike, and there are access points to the trail all around the park. You can stay in car campgrounds or lodging in or near the park. It's easier to get a walk-in permit for a single night than a longer trip, so you may still have the opportunity of visiting a few destinations beyond a half-day's walk. Read more about section hiking the Wonderland Trail here. Mount Rainier from the Tolmie Peak fire lookout. Reached by a way-trail from the Wonderland Trail near Mowich Lake, this makes a great day hiking destination. Even if you're day hiking, always be prepared to survive overnight in the cold and wet should something go wrong. Mountain weather can change fast, hypothermia can be disorienting and deadly, and day hikers sometimes go missing until spring. The average hiker makes it around the mountain in ten days, but the Park Service allows up to fourteen days to hike the trail. If you consider yourself less fit than the average backpacker, you may want an extra day or two. If you're a seasoned thru-hiker you might prefer more miles each day, and I'm sure you know your limits. Do note that the frequent ups and downs of the trail can be tough going. Longmire is the most popular starting point for the Wonderland Trail and Sunrise/White River is a close second. The rest of this chapter looks at the different trailheads, and what to consider when choosing where to start your trip. The ability to store a food cache or two will significantly reduce your pack weight. During the main hiking season you can store food caches at Longmire, Mowich Lake and Sunrise (or nearby White River). Longmire, Mowich Lake, and Sunrise/White River are spaced roughly in thirds around the mountain. It's common to use one of these choices as a trailhead and the other two for caching food. This way you never have to carry more than three or four days of food. The roads to Sunrise and Mowich Lake can open late and close early in the hiking season. Do not plan on using these locations for trailheads or food caches before late July or after the middle of September. You can substitute White River for Sunrise, but there is no good alternate cache location for Mowich Lake. Longmire, Sunrise and Mowich Lake have similar driving times heading south from Seattle. It takes about two and a half hours. Of these trailheads, the drive to Longmire has the easiest roads (even though it's the greatest distance to Seattle). Longmire is also the closest trailhead if you're driving north from Portland (also about 2.5 hours). Longmire is the most popular trailhead for the Wonderland Trail. This is one of the busiest places in the park with many services and a hotel. There's plenty of parking and law enforcement patrols to keep an eye on the lots. There is also nearby car camping at Cougar Rock Campground. Longmire is accessible from the main Nisqually entrance on the south side of the park. Lastly, Longmire makes a good starting point because there are nearby backcountry camps in both directions. This is useful when you need to travel to the park on the day of your hike. During the peak season, Sunrise and the nearby White River are popular trailheads as well. There is car camping at White River and ample parking at Sunrise. As long as parking is available, starting at White River can save you the 40 minute drive up the hill to Sunrise. It takes nearly as long to make the drive as it does to take a straight shot on foot down the trail. Sunrise Visitor Center - White River Campground is located at the valley bottom beyond. The downside to starting at Sunrise is that hiking clockwise, the first backcountry camp is about ten miles away at Summerland. More than a few hikers have been caught in the dark when making the final climb to Sunrise. You may want to spend your first night at the White River front-country camp, so you can fit in a full day of hiking. If you're headed clockwise, starting from White River instead will also shave an hour of hiking off your first day. If you travel counterclockwise from Sunrise, Granite Creek makes a good first destination for a shorter day (about 5.3 miles). There aren't many strong arguments for starting your trip at Mowich Lake. The road can open late in the season and close early. The road is rough to here, and it is not the most pleasant of drives. There are no services at Mowich Lake besides pit toilets and a small campground. Mowich Lake, a glacial cirque is the largest and deepest lake in MRNP with a surface area of 120 acres and a max depth of 90 feet. Going clockwise from Mowich Lake you can take either the Spray Park trail or the Ipsut Pass (Wonderland) trail to Carbon River. If taking Spray Park, Eagle's Roost camp, 1.8 miles from Mowich Lake can be a good target for a short first day. Traveling counterclockwise, the camp at South Mowich River can be reached in about 3.5 fast miles. Minor trailheads include Fryingpan Creek, Box Canyon, and Reflection Lakes. Of these, Box Canyon is perhaps the trailhead of most interest to hikers doing the entire trail. Box Canyon is the closest drive from Yakima. Starting here also allows you to place a third food cache at Longmire, shaving some weight from the beginning and end of the hike. Of these, Box Canyon is perhaps the one of most interest to hikers doing the entire trail. Box Canyon is the closest to drive from Yakima. Starting here also allows you to place a third food cache at Longmire, shaving some weight from the beginning and end of the hike. Besides a restroom, there are no services at Box Canyon. The last trailhead worth mentioning is not actually on the Wonderland Trail. It is useful only for when the road to Mowich Lake is closed because it lets you take advantage of two food caches along the trail. The last trailhead worth mentioning is not on the Wonderland Trail and requires some extra foot work. It is useful only for when the road to Mowich Lake is closed because it lets you take advantage of two food caches along the trail. Carbon River entrance station serves the northwest corner of the park. Just beyond, the Carbon River Road once went all the way to a large car campground at Ipsut Creek, just off the Wonderland Trail. In 2006 a massive winter storm washed out the Carbon River Road, and it may never see repairs. From the washout, it's an easy ~5 mile walk along the old road to the Ipsut Creek campground. If you use the Carbon River Road as your starting point for the Wonderland Trail, you can place a food cache at the White River ranger station and another at Longmire. Again, this is only useful when the road to Mowich Lake is closed. Many backpackers choose the traditional route of clockwise. Other guidebooks state this direction is easier but don’t back this up with any good arguments. Looking at elevation profiles and hiking the trail, I've never learned of nor have I experienced any disadvantage to traveling counterclockwise. Both directions offer great views and both directions lead back to the place you start. When choosing which direction to hike, the most important consideration is if it’s a reasonable walking distance to the first camp in case you also have to drive to the park that day. This used to be a bit of a chore, so I built a custom itinerary planner for the Wonderland Trail. I hope you find it useful. I've designed it to let you consider your elevation gains and losses for each day. Just choose your trailheads and hiking direction, and the number of days you have. The program will try to select evenly spaced camps, and then allow you to adjust any day you wish. When filling out your permit request form, it's good to include a few alternate itineraries in case your first choice does not work. Wilderness permits with weekend start dates are the highest in demand. To better your odds of getting a permit, apply to start from Monday to Thursday. Mount Rainier National Park is about 2 hours from Seatac International Airport (SEA) and 3 hours from Portland International (PDX). Getting to the park from either airport will be a challenge without renting a car. Shuttle Express (1 435 981-7000) offers taxi services to the park, but it may be more affordable (and more convenient) to arrange a car rental. Getting a wilderness backpack through baggage handling unscathed can be a challenge given all the straps. If you go ultralight, you might be able to squeeze your pack in as a carry-on. Otherwise, it's best to buy a cheap duffle bag that can fit your backpack. Most trailheads to the Wonderland Trail are with 2-3 hours of Seattle, Portland and Yakima. Early and late in the season some of the roads may close. The road to Longmire is typically open year-round. The park banned hitchhiking before it even allowed women to drive in the park. Don't plan on being able to catch a ride by having your girlfriend wave at cars while you hide in the bushes. If you somehow get stranded somewhere in the park, there's no law against being friendly and asking for rides from strangers at tourist stops. Look for people who have bumper stickers of multicolored, dancing teddy bears. Don't count on it, but you might have luck finding a ride share on your local Craigslist ride share forum. You are also welcome to post a message at this forum. Sunrise is a three mile walk (roughly +2000 feet in elevation) up the ridge from the White River Campground. The road to Sunrise opens usually by mid July and closes shortly after Labor Day (early September). Use White River Campground instead of Sunrise early or late in the season. The road to Mowich Lake opens most years by mid July and closes sometime in September (or when the first snows arrive). When the road is closed, you cannot use this as a food cache location. There is no convenient alternative for caching food in this corner of the park. Food caches can be dropped-off at the above locations in person. They can also be mailed. Food caches need to be in hard plastic, rodent-proof containers. A utility bucket with a securely attached lid works well for this. Sending fuel in your food cache is prohibited. If you want to cache fuel, you must deliver it in person to the wilderness information center at Longmire, or to one of the food cache containers at Sunrise, White River Campground, or the Mowich Lake patrol cabin. The park service accumulates surplus fuel throughout the season and states the following: "As the season progresses we often have a surplus of white gas (and some canister fuel). We are happy to give you the fuel for free if we have it." Fuel and general supplies may also be available to purchase at the general store at Longmire or the day-use lodge at Sunrise. It's best to phone ahead to see if they'll have what you need in stock. You can get in touch by calling Rainier Guest Services (the consessioner for MRNP) at (360) 569-2275. If shipping a food cache, the Park Service states the delivery date should be at least two weeks before the date you plan to pick it up. From the ship-to locations, the Park Service manually transports food caches up to Mowich Lake and to Sunrise or White River, and they may not make this trip every day. If you procrastinate on mailing your cache you may find yourself without it when you need it. Also, the Park Service will not hand deliver food caches around the park. In other words, you can't drop a food cache for Mowich Lake off at Longmire or vice versa. Send a food cache to the address that corresponds to where you need to pick it up. Since the park may update their instructions after this has been published, always reference their latest instructions before shipping a food cache. Label every food cache with the name of the permit holder, the permit number, the location the cache will be picked up, and the date the cache will be picked up. Send caches to the address corresponding to your desired pickup location. 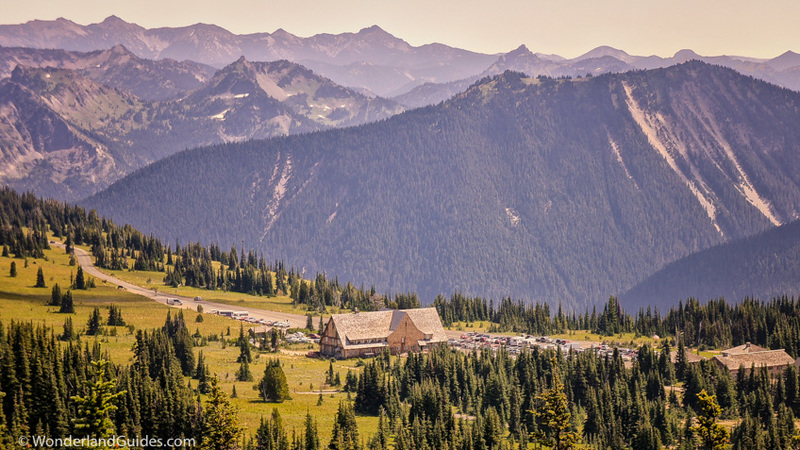 There are four front-country car campgrounds in Mount Rainier National Park. The reservation system is handled separately for these campgrounds than for wilderness permits. All front-country camping in the park must be in one of these campgrounds, and sleeping in your vehicle is prohibited outside these locations. Please do not bring firewood to the park since this spreads invasive species that can devastate forests. Local firewood is available for purchase at the Longmire General Store, Cougar Rock, Ohanapecosh and White River Campgrounds. Located within walking distance of Longmire, Cougar Rock Campground makes a good place to spend the night before or after a backpacking trip starting from Longmire. You can make reservations on Recreation.gov. Cougar Rock can accommodate RVs up to 35ft in length, and trailers up to 27ft. Just down the hill from Sunrise, White River makes a good place to spend the night before or after a backpacking trip starting from here or Sunrise. As of February 2016, you cannot make reservations for the White River Campground. It can accommodate RVs up to 27ft in length, and trailers up to 18ft. Mowich Lake has 10 primitive walk-in tent sites. It is shared with backpackers on the Wonderland Trail and fills quickly. There is no potable water here and fires are not allowed. It is not the nicest campground in the park since it affords little privacy, but it's a convenient place to spend the night before starting a trip on the Wonderland Trail from here. 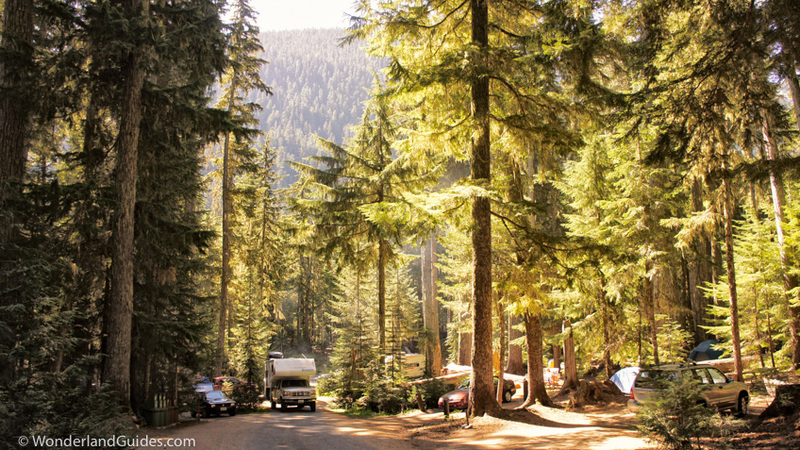 The largest car campground in Mount Rainier National Park, Ohanapecosh Campground is the furthest from the Wonderland Trail. The closest trailhead is a 25 minute drive away at the Box Canyon overlook. It can accommodate RVs up to 32ft in length, and trailers up to 27ft. It may be most useful for visitors driving to the park from Yakima. You can book a site at Recreation.gov. Hotel accommodations in the park are limited to the Paradise Inn and the nearby National Park Inn at Longmire. The Paradise Inn opens May 20 and closes after Labor Day. The 2016 rates for standard rooms are estimated to be between $122 and $192. Larger suites are available for more. For reservations call (360) 569-2275 or (855) 755-2275. Open year-round the National Park Inn is located in Longmire Village. It can be a convenient place to stay before or after a trip on the nearby Wonderland Trail. Standard room rates for 2016 are estimated to be $120-160 for a room without a private bathroom, and $176-218 for a room with a private bath. Two room units are available for $263. There are ample opportunities for hotel accommodations outside of the park. Use a hotel booking site like Priceline, Expedia, or Orbitz for lodging near one of the following locations. You can also find many private cabins nearby on Airbnb. Gas is not available anywhere in the national park. The drive can be long, winding (and steep) from one side of the park to another, and even your little hybrid will be guzzling the gas on the hills. It's easy to run low on gas in the park. Expect to get your vehicle's worst fuel economy, and top off at one of these gas stations (Google Maps) before entering the park. General supplies and limited groceries are available from the Longmire General Store and the gift shop at Sunrise. For anything more than a snack and a postcard, you'll need to visit one of the communities surrounding the park. Groceries can be found at Ashford, Elbe, Packwood, and Enumclaw. A few essentials may be found at the Longmire General Store. Toward the end of the hiking season the Wilderness Information Center at Longmire sometimes has surplus fuel they can give you. For something serious like a replacement for a forgotten water filter, you'll need to head out of the park. On the south side of the mountain, there is Whittaker Mountaineering in Ashford. On the north side of the mountain, you'll need to drive to the Puyallup and Tacoma area. Sportsman's Warehouse is the closest big outdoor retailer, located at 120 31st Ave SE, Puyallup, WA 98374. It's next to a Walmart that also has a sizable sporting goods department. The nearest REI is twenty minutes further in Tacoma and is located at 3825 S Steele St, Tacoma, WA 98409. Cell coverage in the park doesn't exist. As of 2016, only one carrier (Verizon) offers coverage in Ashford. On Highway 410 near the NE corner of the park, Crystal Mountain has limited coverage. On Highway 12, Morton and Packwood have fairly good coverage. There is no wi-fi available in the park. Below is a list of the closest free wi-fi locations. The Copper Creek Inn and BaseCamp Bar & Grill in Ashford both offer free wi-fi. Enumclaw has good cell (4G) coverage. You can also find wi-fi hotspots at local businesses across town as well as the public library. Crystal Mountain Resort is about a 30 minute drive from White River Campground and offers free wi-fi. Design custom itineraries from any trailhead on the Wonderland Trail, round-trip or one-way. 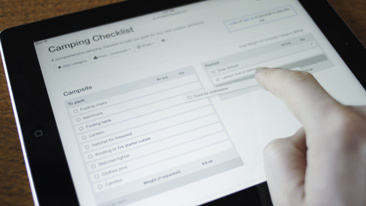 The best packing list manager on the web. Track weights of everything in your pack. Check out this demo of a wilderness first-aid packing list then start your own lists. Newsletter - Get occasional updates and news from Wonderland Guides. Use these as a starting point to plan your trip or check out the Itinerary Planning Tool to build your own. For this itinerary, hiking from Summerland to Nickel Creek (over Panhandle Gap) on day nine will likely be the most challenging. It’s also a particularly beautiful section of trail, so if you’d like to add in an additional day, this would be the place to do it. If you can get the reservations at Indian Bar, hike from Summerland to Indian Bar on day nine, and then go from Indian Bar to Nickel Creek or Maple Creek on day ten. For this 11-day itinerary, the most challenging section will likely be the second day, when you hike from Devil’s Dream to Klapatche Park. If you want to add in an additional day, you might consider splitting this section up. For most hikers, I don’t recommend an itinerary shorter than ten days. For many hikers, the Wonderland Trail will be the most challenging backpacking trip they’ve experienced. If you’re an avid backpacker and know what you’re getting into, I’ve provided a few shorter itineraries below. Hiking counterclockwise and reversing this itinerary gives you the easiest start possible.